By adding HydroTops Solo Boost to your nutrient feeding regime, you'll boost the number of flowering sites immensely on your plants, whilst stimulating correct nutrient assimilation thanks to its pH balanced formula. When added during the fourth and fifth weeks of the bloom period, HydroTops Solo Boost also helps to harden and tighten flower sets, creating even larger flowering tops and heavier crops. 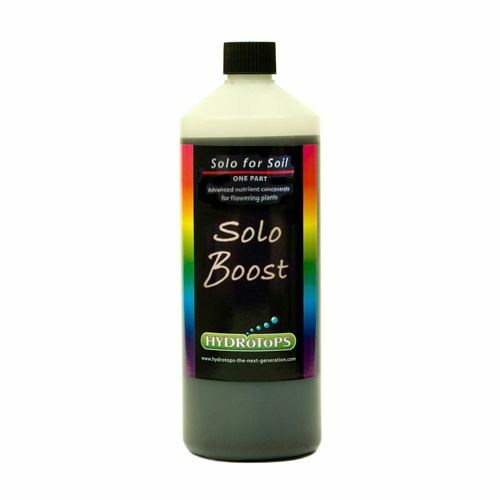 Use Hydrotops Solo Boost from the first week of growth onwards at a rate of 1ml per litre, this will boost upward, healthy growth in the vegetative period alongside HydroTops Solo Grow. To use in the flowering period, dilute at a ratio of between 2ml and 5 ml per litre depending on your current week of flower, alongside HydroTops Solo Bloom, before finishing with a large dose of 10ml per litre as a flushing agent to tighten and harden blooms.